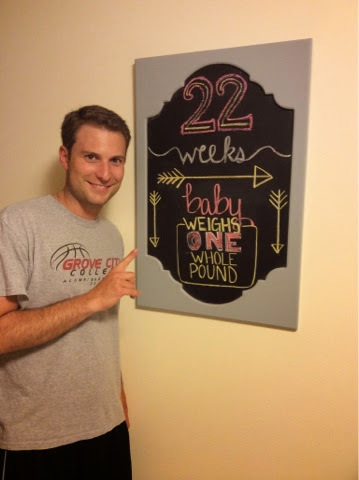 Best Moment This week: Hubs being able to hear baby movement in my belly! Miss anything? : Drinking a summer shandy in the warm weather! You look so cute! Love that little baby bump! Ahhh Amelia - How cute are you?!?!?!! I'm so thrilled for you, friend, as you embark on this exciting journey. Your board is so cute - and what a special thing to have to look back on. You are so sweet, friend! Thank you :):) We are SO incredibly excited! And I found lots of fun things for little babe's room! :) Thanks! You are the cutest preggo ever!! My sis-in-law is preggo too and she's all about the chocolate milk!! You are just too precious! Can't wait to see what the nursery looks like! You look adorable! I loving these pregnancy updates you have been giving. Congratulations! I am finally catching up on my blog reading and just saw that you are pregnant! So exciting! The time goes by quickly, enjoy it! You are the cutest pregnant woman ever! 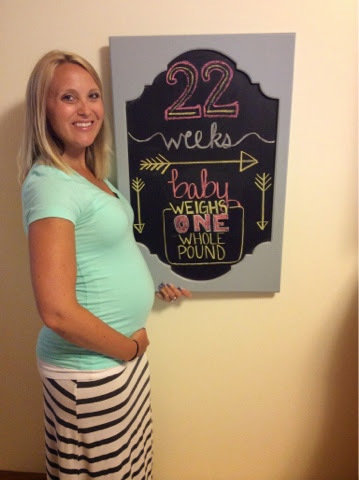 Congrats on the little peanut growing in there! Your chalkboard is adorable. I've seen that idea on pinterest but how do you get it so cute with chalk? I could never do that. Please teach me your ways! P.S. I'm your newest follower and also a fourth grade teacher! Congratulations to both of you! And I totally agree with them, you're one cute preggy. I'm glad there isn't much problem with your pregnancy.